What’s Good About Our Sheep? Someone asked me that yesterday. How to answer that. Ric looked at me, wondering what I was going to say. I love our sheep but what’s good about them? We talk a lot about constitution. I call it character. I love their personalities, all so different. There are the leaders, the mischief makers, and the bully boys. When you think about it, men and sheep have been in a partnership for a very long time. They’ve given us wool to clothe us and meat to keep us fed since the beginning. And we’ve cared for them, protected them and made sure they had enough to eat as well. A real partnership. Sheep behave very like humans. Have you ever compared loading a Boing 427 to loading four decks of sheep? Both the same number. It’s a very similar experience. It’s this trust thing. I love taking our students that come to the shows, to help parade the animals, aside and telling them just to go and sit for a while with the sheep they are to take out. Just sit in the pen and talk to him. It relaxes them and gives them so much confidence. – The students. The rams love it too. Oh, I can hear you say, how do you know that? Come and look at them. We have a sheep named Bella. Bella first came to our notice when she had triplets first up. We had to leave to go to the Dubbo show and left three ewes and seven lambs to fend for themselves. When we returned there were three ewes and three lambs. Each ewe could only defend one lamb from the fox. But defend one they did. Two more sets of twins later, Bella last year got an infection in her leg. We were in the process of moving and the ewes were going out on agistment, until we could bring them down to Narrandera. We gave her a few injections of antibiotics but couldn’t care for her better than that. When we came to load them all on the truck to come down to our new farm. There was Bella limping along at the back of the mob, saying “Wait for me, I’m coming too.” So do you call it constitution, stubbornness or loyalty? One month later she delivered a ram lamb. A miracle, surely. And she raised this lamb and he is now in our show team and coming to Sydney. He needs a name, and this year it has to start with H. Any ideas? Let me introduce you to Bella’s Lamb. 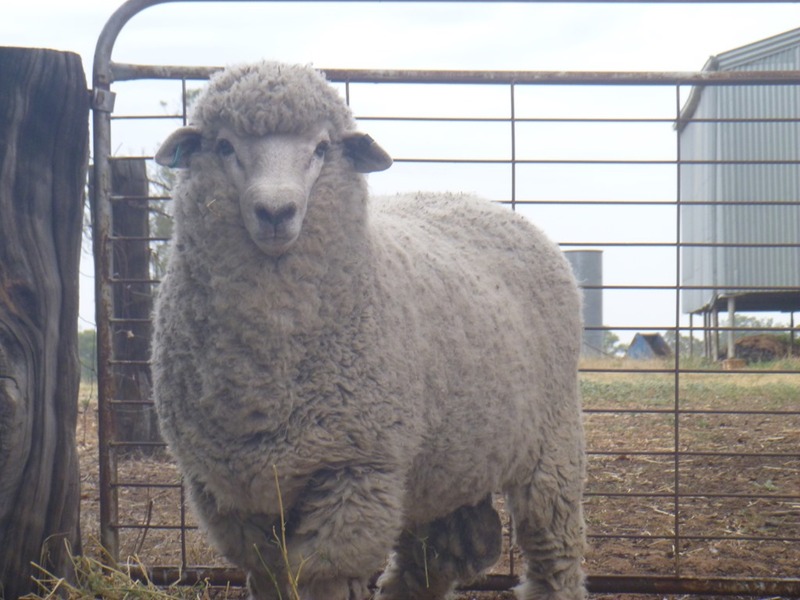 This entry was posted in Uncategorized and tagged Corriedales, sheep rearing, sheep showing, The Sydney RAS Show. Bookmark the permalink. 2 Responses to What’s Good About Our Sheep? I loved the story about your sheep and Bella and her lambs . What about Horace, Horatio or Hector? Whatever you call him I hope he does you proud at the Show. Robin.